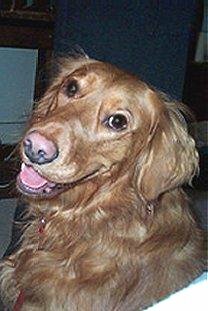 Lucy came to Sue Pellegrini’s home in September, 1998 with just a collar and a worried smile. She was afraid of everything, but possessed great character and heart. After a year of good support and training, her self esteem is at an all time high. The highlights of her life are her tennis balls, long walks and snuggling on the couch. Friends and neighbors comment on how far she has come and how sure of herself she is these days. Everybody loves Lucy, for sure.